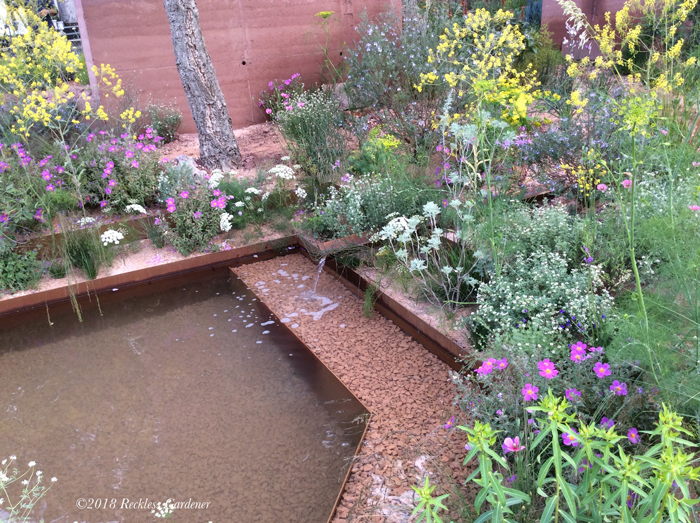 As the Met Office predicts a warm summer, and who knows the inevitable hosepipe ban, we take a look at some drought tolerant plant tips from award winning designer Sarah Price. 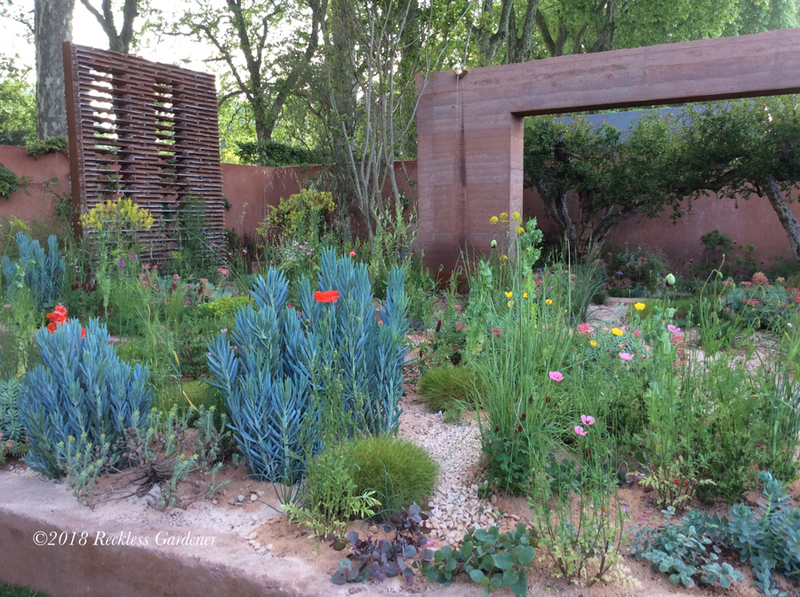 In the run-up to this year’s RHS Chelsea, growers and designers had to put up with rain and snow storms, unseasonably cold weather and unpredictable growing conditions. May and early June however, has turned out somewhat different with prolonged dry hot spells for many and torrential downpours for others. 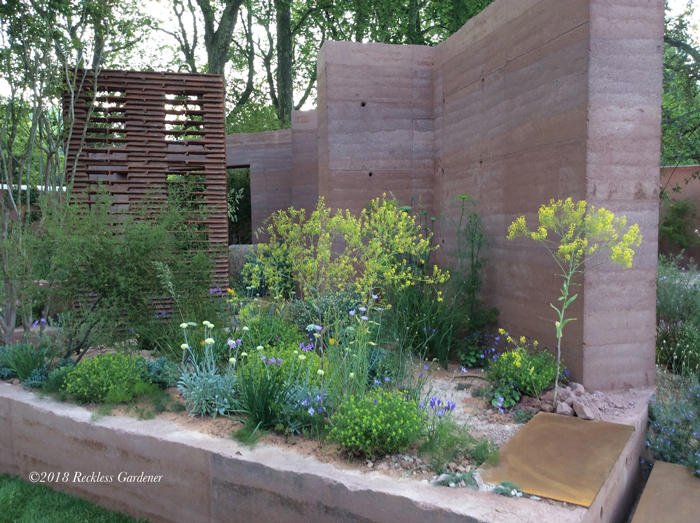 Gold-medal winning designer, Sarah Price, (pictured above) whose garden for M&G (Gold) at the 2018 RHS Chelsea Flower Show, captivated us with its Monet inspired Mediterranean planting and drought tolerant species, used a diverse and colourful array of flora from warmer climates. Many of the plants she chose, such as Euphorbia rigida and the yellow horned poppy, Glaucium flavum, flourish in harsh climatic conditions and in areas that receive low levels of rainfall. As our climate warms up many gardeners are considering plants more suited to a Mediterranean climate and below Sarah shares with us some of her top tips for surviving the drought. Sarah points out that the diverse Mediterranean landscapes, such as dry meadows or high-altitude steppes, have an intriguing, raw beauty that is far removed from the quintessentially British manicured lawns and herbaceous borders: “It’s all about tuning into a different sensibility so that we adjust the way we look at plants and how we garden,” says Sarah. 2. Choose ground cover plants; such as Thymus, low growing Achillea and Teucrium that will hug the ground and shade it, thereby reducing moisture lost to evaporation. 5. If possible, source plants that have had very little feeding or irrigation; this will encourage tough and hardened plants; avoid nursery plants with malformed root systems; roots need to grow deep into the soil for moisture. 8. Plant in autumn to allow the water-seeking roots to establish before spring; Smaller plants demand less water to help them establish. Asphodeline lutea (Yellow Candles); Catanache (Cupid’s Dart); Centranthus lecoqui (Mauve valerian); Cistus criticus (Cretian Rockrose); Crithmum maritimum (Rock samphire or sea fennel); Dianthus carthusianorum (German Pink); Glaucium flavum (Yellow horned poppy); Lotus hirsutus (Hairy canary clover); Origanum dictamnus (Dittany of Crete); Polygonum scoparium (Brittany Perennials); Salvia argentea (Silver Sage); Senecio polydon (Senecio Genus); Thymus neiceffi (Juniper Leaf Thyme); Teucrium ackermannii (Tree Germander). 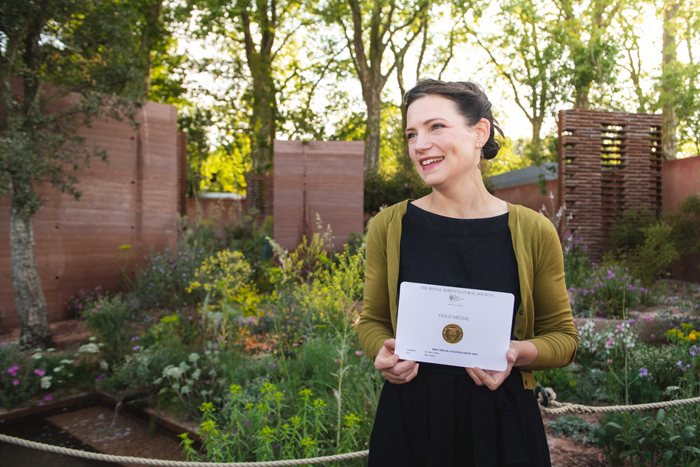 Picture credits: Picture of Sarah with gold medal ©M&G, all other pictures ©Reckless Gardener 2018.